Pieces of wonderful: Lexie really loves..
Well hello! I hope you have had a wonderful week. I simply had to stop by to take a break from my Christmas craft series and share some loveliness with you all. Cast your minds back to the warmer days of October- you may remember I posted about a delightful little shop called 'Lexi Loves'. Well, a few short weeks ago while browsing the Lexi Loves facebook page I stumbled upon an image of Lexi's most wonderful handmade Christmas baubles..let me tell you, I was sold then and there..completely lovestruck. So I contacted the very lovely Lexi via her twitter and managed to snag myself a pair of these beautiful baubles at a real bargainous price. After waiting two whole weeks to be able to get to the royal mail depot (What a pain it is when you work full time and the depot only opens between 8 and 12 everyday) ..today was the long awaited day and my, how lovely the baubles truly are! Just take a look at what was waiting for me inside the little box wrapped in pink..
Aren't they pretty? I love them, I really do! They are so well made and they are quirky and whimsical and they go perfectly with my other decorations! They look perfect on my tree (Yes..as of today my tree is up and standing proudly in my living room..don't judge me though, I'm simply too busy to put them up next weekend and I must have them up for the entire of December because I love Christmas so much!) and I couldn't be happier. 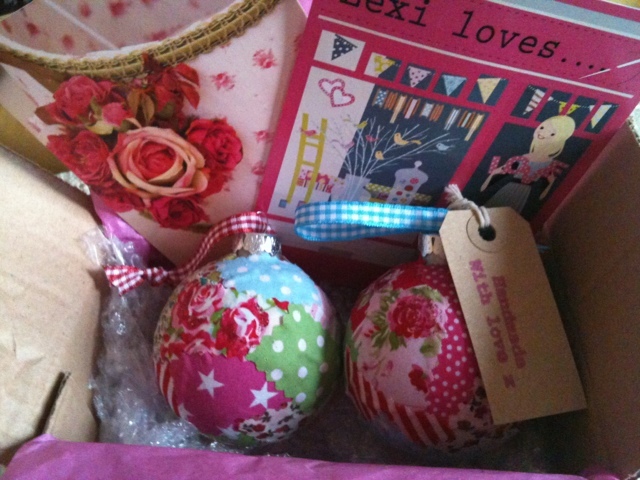 Thank you Lexi Loves for my baubles and my beautiful postcards. I am a fan for life! So, if you are admiring these beauties with lust in your hearts then you must make some time to visit Lexi's shop..you won't regret it! 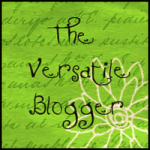 You can follow Lexi Loves on Twitter, Facebook or Via her blog...make sure you do! I have also been busy making my handmade Christmas cards and I will be sharing them with you tomorrow in part 3 of my 'Tis the season' Christmas craft series..